Virginia Bodman, wife of my Viola Professor, Lyman Bodman, was a piano accompanist of extraordinary musical depth and power. She also had a phenomenal ability to read music at sight, a skill she graciously used to assist me in my composition assignments at Michigan State University. As a sight-reading pianist she had a friendly competitor, Warren Martin, assistant director in those days of the Westminster Choir in New Jersey, and something of a musical legend at the Westminster Choir College and at Princeton. These two friends loved nothing better than to challenge one another’s acumen with unknown music. So, on one of Martin’s many visits to their home, he was given one of my assignments as a challenge. They had so much fun using what I had written that I composed new works specifically for his future visits. 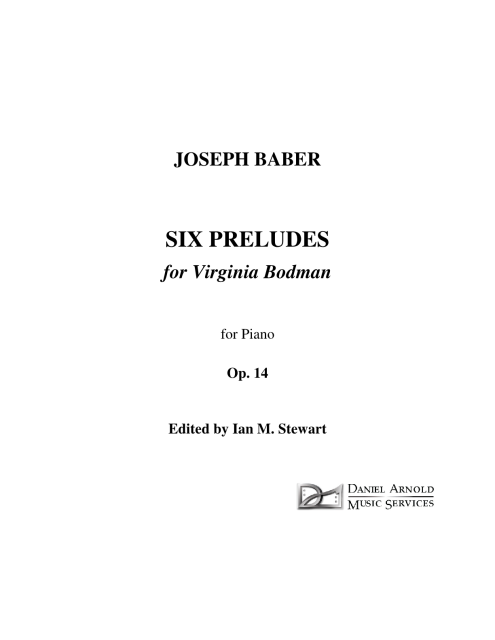 The results, assembled later, are this set of six Preludes, all but one written between January 1959 and June 1962. (The one exception is No. 5, which was amended from a Gottschalk study I had made at the University of Miami in 1956-57 when I was studying with Renée Longy.) For the most part, these pieces were child’s-play for such adept pianist as these two were, so in No. 3 I set out to perpetrate a nearly unplayable piece, consisting of a sublimely-innocuous, right-hand melody linked to an asymmetrical, left-hand accompaniment filled with almost-impossible leaps. The right and left hands reverse this arrangement on alternating phrases.